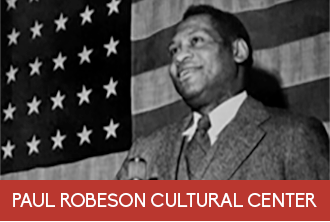 The Paul Robeson Cultural Center (PRCC) was founded in 1969, and is dedicated to serving the Rutgers University community by offering a wealth of programs, initiatives and services that reflect the robust history, heritage and diversity of the African diaspora. Widely recognized as the first black cultural center on a college campus in the United States, PRCC, like most black cultural centers was established in response to the activism/struggle of black students, who organized a campaign calling for greater representation of black faculty, students and staff members. Named after one of Rutgers University’s most esteemed alumni, Paul Robeson, PRCC has functioned as a safe haven, “home away from home” and community hub for our students, staff/faculty, alumni and community members of the greater New Brunswick/New Jersey area. As the Paul Robeson Cultural Center celebrates and honors Black diasporic experiences/identities, we consider ourselves a vibrant and instrumental component of University life, committed to make Rutgers an inclusive and welcoming space for all populations by way of community outreach, student support and cultural/educational resources. The PRCC offers programs/events celebrating the contributions of African-Americans to American and global literature, the sciences and arts. Signature programs include Open House, Robeson Arts Week, Black Arts Gallery Series, State of the [Black] Union Address, Kwanzaa at Rutgers, Sankofa Film Series, Homecoming BLACKout Weekend and Rites of Passage Graduation Ceremony. To place a room/equipment reservation request, please click here. At the Paul Robeson Cultural Center, our students are encouraged to consider the complexities and intersections of their identity, while celebrating Blackness in all of its expressions and build on the founding legacies of academic excellence and intersectional social justice. Come visit PRCC and take advantage of all we have to offer!